My favorite summer wasn’t when I was 13 at a summer camp. It didn’t involve a first kiss with a boy, or even some amazing vacation. My favorite summer was when I was 29; the summer of 2002. I had been living in Portland for a little over a year and a half, and since I had lived there I had already moved four times. I had moved more than 20 times before I graduated from high school. It wasn’t too surprising that the pattern had not not broken, not even today. I remember places and time frames based around the names of houses, and houses’ names are either based on the street, the neighborhood or the color. This summer took place in the Harrison house. A two story house on a busy one way street in SE Portland. Due to a crazy chance of coincidence a friend of mine from the Garmisch days happened to be living in Portland at the same times as me, and she just happened to need a roommate, and I just happened to need a place to live. I need to stop the record here and back track a moment in time in order to give a background on the small cast of characters in this story. From 1998 to 2000, I lived in Garmisch-Partenkirchen, a place I used to refer to as living in a postcard. It was a pretty country valley in the Bavarian Alps. A small farm town with cows that wandered the streets, old farmers, and small clubs that had names like Peaches, Evergreen, and of course the Hausberg disco that all of us Garmishers called the Dirty Disco. I had worked for AFRC, the Armed Forces Recreation Center. In laymen terms I worked for the U.S. military at a resort for military. While there I was housed in a former Nazi hospital that the Americans had taken over after WWII, and now it was filled with young and a few middle-aged Americans. I made incredible friends while in Garmisch; people I am still close with today. One of those friends was Lisa, and another was Sue−sweet sue. 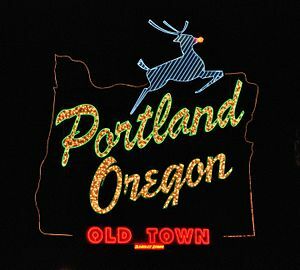 In 2002, after a short life in Prague and a short life in Denver, I seemed to be settling in Portland, Oregon. I ended up in Portland on the advice of my friend Sue, who had also left Garmisch. Sue literarily drove from Oregon to Chico, California where I was staying with a friend, and drove me to Portland, where she dropped me off with her friends, and then she immediately left for Eastern Oregon to her home in Cove. Sue did things like that, she was a driver. She loved driving. Moving. Traveling. Exploring. She was always leaving. It was nearly six or seven months after I had moved to P-Town when I learned that Lisa was also living in Portland. At the time I was living with my soon to be ex-boyfriend, and I needed to find a place to live. As happenstance would have it Lisa needed a roommate. I moved into the Harrison house, and it was the second time Lisa and I had lived together and it wouldn’t be the last, but that’s in the future, and not in this story. Portland is a transplant city. It is difficult to meet people who are born and raised in Portland. By the time I moved thirteen years later 85% of my friends were Portland natives, but it took me a couple of years and one retail store called Presents of Mind, to find them. I was from California, and so was Lisa, and our other roommate Rita. We were a California house. I noticed a lot of people moved like this or some how met up with and lived with people from where they came from originally. I called them state contingency houses. My ex-boyfriend’s house was from South Dakota, Sioux Falls. My ex was friends with a guy named Elliot who lived in a Chapel Hill house, although he was really from New York state. The only woman that lived in the four person household was Amy who was actually from Chicago. They had all met in North Carolina, Chapel Hill and had decided to move to Portland together. The Chapel Hill house and the South Dakota house were in the North East, and I lived in the South East. At the time there wasn’t much on Alberta where we had all lived (I had moved from NE to SE when I moved into the Harrison house) except two or three bars, a couple of Mexican restaurants, a huge latino church, a barber shop, and a Chinese pizza parlor that seemed more like a front for something. Today, a person would never recognize the Alberta we had lived on. Portland has changed a lot in the past fifteen years. It’s now considered one of the most livable cities, and Alberta is filled with trendy shops, expensive Ice Cream, and a pricy but a tasty Indian restaurant. Portland has been cleaned and polished. I’d say white washed, but it’s always been white. Alberta was a predominately black working class neighborhood when we had lived there, and most of the white and latino families living there were also working class, or artists, or dirty clowns (yes clowns) and new house owners. It was right before the house flipping that would be the beginning of the changing environment of Alberta. Harrison and 12th in the South East was a main thoroughfare with one restaurant bar and residential homes that you could tell were built before the road was planned. Our house and the houses on either side of us were similar rickety run down houses that shook when large trucks drove by. Behind the houses were warehouses. It was a little dirty and a little gritty like a lot of Portland was during this time, but this was right before the Pearl was built. One night at a tiny bar on Alberta in a little bar called “Whatever”, I went to to the SE side to visit Elliott and the ex. Sue was in town visiting and we were sitting around the juke box talking about music. Amy’s boyfriend and all of her roommates were in a band. Most of Portland was in a band because Portland was a music place. At some point Sue brought up that she played the guitar and had been playing with a couple of musicians in Cove. Amy mentioned that she played bass in an all girl metal band called White Zinfandel when she was living in Chapel Hill (or maybe Chicago). I mentioned that I had played drums in a band in Chico, a band called Rumor Mill. We even had two newspaper write ups in the local paper. I still have those and feel really proud of my short amateur experience as a drummer. “We should start a band.” Amy said. Ted or one of the other boys agreed. The Harrison house had a garage, and Ted agreed to let me borrow his drums in exchange for the storage space. It was the beginning of Summer. Sue would be moving to Japan in August. She had gotten accepted into the Jet program so we knew it wasn’t going to become something serious it was just going to be something fun for us to do over the summer, a good excuse to spend time together and drink wine. During our first session Amy brought a book of illustrations by an artist whose name I no longer remember. One of the illustrations were of a white rabbit dressed in a suit being carried on the shoulders of other anthropomorphic animals. The name of the drawing was “Our Hero George”, and that became the name of our band. I don’t know how many days a week, Our Hero George practiced, but I felt like we spent the entire summer in that garage on SE Harrison and 12th street. We’d open the garage and leave it open while we practiced. It was summer and the cars were always busy passing drowning out the sounds. We would share a large bottle of wine and talk and make music. At first we just planned on doing some covers. The first song we learned was Dear Prudence by the Beatles with Sue singing the lead and Amy and I singing back up. Our next cover was You Don’t Own Me by Lesley Gore, only we changed the arrangement a bit, and both Sue and Amy sang. During this time Amy was taking classes through the Oregon Tradeswomen’s center. She was learning electrical engineering. She came to practice with a story about one of her teachers. “Penny Painter. She’s a real task master.” Amy had said. Sue loved Penny’s name, and the phrase task master, and from that we wrote our first song, Penny Painter is a real task master. Our second song also came from a story by Amy. A story about her temperamental cat Polly. We eventually began writing our own music. Songs about task masters and mean cats and rain falling like tears. The summers are rarely hot in Portland, and the summer of 2002 was no exception. Beautiful, mild summers with maybe a week or two of heat. We kept the garage open not because we were too warm but because the days were too beautiful to miss, and because of the busy traffic and that we practiced during the day none of the neighbors ever complained. In the house next door to us there was another band. A good band. They were called The Exploding Hearts, and they were a young up and coming 70’s punk revival band. Occasionally, Adam or Terry the, two boys from the band, that lived next door would sit outside smoking cigarettes, and offer us kind words of encouragement. At some point during the summer once we had created five solid songs, we decided we should have a show. We couldn’t spend the entire summer writing music and playing songs, and not have at least one show. Sue would be leaving in August for Japan, and Amy’s birthday was coming up in July so we planned for July 27th, 2002. It would be the premiere and final performance of Our Hero George. We would celebrate Amy’s 29th birthday and Sue’s going away party. Lisa had always been the queen of parties. Every party she ever had was decorated and decked out in a kitschy sophistication. She strung lights all through the backyard of the Harrison house and set up tables and chairs. We set the stage on the back porch. We had created invitations and handed them out to all of our friends. The three of us had friends from different parts of our lives coming together for this one night, along with friends that Rita and Lisa had invited. The night of the show we had more than thirty guests. As we played, people from the street heard the music and came into the backyard to watch. The boys from next door watched the show from their own backyard; always smoking cigarettes. When we finished we had cheers and calls for encores. From a random conversation in a now obsolete bar in NE Portland we brought Our Hero George to life−for one night. In the summer of 2003, nearly a year from the date of our show, The Exploding Hearts were driving back from a show in San Francisco. It’s believed the driver fell asleep at the wheel. The van flipped and three of the four members died. Adam our neighbor was one of the guys who died. In February of 2008, Sue was driving from Florida to Portland when somewhere in New Mexico her car flipped and she was killed instantly. It had been a year since I had last seen Sue. Soon after the show she moved to Japan where she lived for two years. After Japan she went to graduate school in Vermont. Over that time period her letters and her e-mails became less frequent until it would be years in-between our communication. I saw her one or two times during the six years she was gone. The last time was at a coffee shop on NE Alberta. It was a short visit, but a dear one because I didn’t know it at the time, but it would be the last time I would see her alive. Sue’s death tore a hole in my heart. Such a huge, huge loss of life. She was a beautiful musician and a beautiful person from the inside out. During the days of our summer band sessions I had a small tape recorder and I recorded all of our conversations and practices. We had also wanted to make a small music video. It was filmed on Super 8 but we never did anything with it. I still have these cassette tapes and film footage stored away waiting for me to find a way to make them digital and put them together. This is something I’d like to do. It could be something I could share with Amy, who ended up marrying Ted and having two boys, something to share that was ours. A special time that we had shared with a tremendously amazing person. It’s something I would really like to do. To see that one summer one more time. The journey started over a week ago. I ended my job, left my room in the house where I rented space, and I left Portland, OR. I’ve lived in Portland for thirteen years. It would be thirteen years’ on the 11th, but I didn’t quite make it. I had always had a love hate relationship with the city. I loved the people I became friends with, I loved the easiness of living, I loved the beautiful scenery and the fresh woodsy air, but there was something I disliked too. It was a something that I could never put my finger on and still can’t. A feeling of not really fitting in. I could never really make things “work” in Portland. I found that finding the job that was in line with my career dreams was unreachable except through volunteering (which I did but it never or rarely turned to pay) romantic relationships seemed impossible, and creatively I lumbered along like a bog sloth. I was complacent and I didn’t create, and I couldn’t break out of the rut. Yes, yes, I know this is not Portland’s problem it’s mine, but all the same, the dislikes compelled me to leave. To become uncomfortable. I’m what you call between employment. I need to make a small amount of money last a couple of months in two countries before my new job begins. I’m going to be a teacher. In China. I don’t know what that will be like, but hopefully in the next year I will be able to expound on this experience. I left Portland on the fifth of August. Most of my personal items were sold or given away. I’ve stored some boxes of books and photos, two small items of furniture, and various sentimental knick-knacks at a friend’s house (my former roommate/landlord). The contents of my life can literally fill a small car. I’ve packed two large pieces of luggage each weighing just under 50lbs. I have a carry on, my laptop, and a purse. These items will be my possessions for the next year. In order to officially and legally work in China I had to go to the consulate in San Francisco to pick up my visa. This made for a great excuse to take a road trip from Portland to San Francisco where I could stop in a small college city called Chico to visit my mom. My friend who wanted to use the opportunity to visit her family and also road trip was the driver and my final companion for my last road trip on the west coast; maybe not forever, but for awhile. My friend, and I are Portland transplants, both of us Northern California natives, so a trip to California is also a visit to our first homes. We stopped for a night in Crater Lake and camped. The night air was warm and smokey due to the fires in Southern Oregon. We made a small contained fire, ate snacks, and drank vodka mixed with grapefruit juices manually squeezed from grapefruits, with added bing cherries and cherry juice. All of these items were left over from my going away party. We drank our cocktails in front of the fire. Cocktails and camping in Crater Lake seem contradictory to me like the two don’t belong. We needed beer or a bottle of whiskey. In the morning we drove to the lodge and walked to one of the many viewing points. We walked on a hiking path to Discovery Point, and there we silently stared at the crystal water that reflected the clouds. The line between earth and sky was blurred and my thoughts drifted to my friend Sue who died six years before. It was Sue who convinced me to move to Portland in the first place, and on our drive up from Chico, Ca we stopped in Crater Lake. I hadn’t been to Crater Lake since that trip 13 year’s ago. Now, I was leaving and I would never see Sue again. I knew I wouldn’t see her again when I got the news of her death, but it still floors me year’s later. It was hot and smokey like we were driving into desolation. The hazy sky reminded me of images of China’s cancer villages. Rarely a blue sky I was told. I’m hoping that it is not as thick as this burning air. In Shasta we took a detour to Whiskey Town Lake. We set up a make shift picnic and split a beer and ate cherries and chips. I waded into the water that was warm. The red clay beneath the water swirled under my feet and turned it pink, but only when I moved. I wanted to swim, but my suit was packed and I knew from many childhood experiences that the clay stained your clothing. We drove the rest of the way to Chico, and spent a night with my mother. That evening we went to a bar I used to frequent when I was a student at Chico State. That night we had more attention and flirting-with and come-ons in the one night then either of us had had in years in Portland. It’s always fun to be new in a small town. I may have spent my teenage years hanging around downtown Chico from time to time, but the places my teen self would go are gone, and that was years ago. I may have spent five years of my twenties going to bars and restaurants, and bookstores, and record stores, listening to bands, and running into people I knew, but those days are long ago. Those places are changed, the bands are gone, and the kids have kids. When I sat for nostalgia’s sake in this bar where I spent one too many days during my spring finals it was as if I had never been there before. In the morning my friend said good-bye, and the reality of my actual life change hit, but only subtly because I had decided to stay with my mom and staying with her is like nothing has changed. I’ve been here for five day’s now, and tomorrow I will see an old friend, my oldest. A friend I met when we were eleven or twelve, and I will spend the night in my hometown of Paradise, and then on the eleventh we drive to San Francisco, and that is where things will begin to take hold. In San Francisco, I have that final step left to take before I get on the plane to China. My visa. It has been difficult getting my paperwork from China in order for me to apply for the visa, but it is all finally here waiting for me at a friend’s house in San Francisco. Two days ago I felt fear. Fear of the unknown, fear of failure, fear of the plane flight, fear of being lost. Today is calm. Excitement hasn’t hit yet. Maybe, I don’t understand what I’m doing yet. I know I don’t understand because I don’t know what I’m doing. I have no idea what is happening next and I’m excited about it. For every door that closes another door opens… so the saying goes. Anyone ever see the movie Cube? It’s a sci-fiction movie released in 1997. Seven strangers wake up inside a cube. A similar scenario to the Twilight Zone episode 79, “Five Characters in Search of an Exit” (which I was excited to find out was the inspiration behind the idea for Cube. Isn’t it great when you pick up on such nuances before reading them on wikipedia).It is also similar to Sarte‘s “No Exit,” which was the inspiration behind episode 79. Episode 79 spoiler* In “Five Characters in Search of an Exit” it is revealed to the audience that the five characters who wake up in a cylinder are really donated toys that believe they are living beings. This revelation is not quite as frightening as “No Exit” because if you think about it the toys are being donated so they will on christmas day be given to some boy or girl. Will this be terrifying for the toys? If they are anything like the Velvet Rabbit then no. And, eventually they will be out of the cylinder. In “No Exit” the characters are in hell, and hell as we figure out is being stuck in a room with other people with literally no exit, and most likely for all eternity. Cube takes this idea further by putting the characters in a giant cube suspended in nothing (very much like the hell jail scene in Time Bandits— you’d know it if you’d seen it). Inside the Cube is an extensive labyrinth of rooms, and each room has several doors some even on the floors and ceilings. Each room is different yet the same, and the characters along with the audience don’t ever know which way is up or down. As the characters remain longer in the cube personalities under stress appear, some become annoying, some are secretive, some are aggressive, some weak, some silent, some heroic, but each in their own turn is another’s hell. But, as far as hell goes in this film it is not just the people who are hell it is the Cube itself because if you choose the wrong door and enter the wrong room you suffer a grotesque and bloody death. Lastly, Cube never reveals why they are there or what the cube actually is. The characters never know or find out if they are in prison or in hell or in a social experiment, and neither do the audience. In the echelon of great sci-fi movies Cube is somewhere on the lower middle end. It’s a cool idea, and the design of the cube is awesome, but the acting is pretty bad. It’s not horrific acting just not great acting. In cases like these I can never tell if it was a bad director that didn’t know how to get good scenes from the actors or if it’s just sub-par actors either way the acting is what keeps this film from reaching into the upper echelon of sci-fi. But, I’m not really talking about a film or doing a film review in this post. I’m talking about doors closing and doors opening. In the past few years, I’ve felt my life’s journey has been a bit like the Cube. It was “No Exit” for a while, but then it seemed like I had some options of doors, yet each one I tried to open felt a bit like getting emotionally eviscerated. As each door closed, and had some pendulum swing across the room to cut me in two, I’d turn and find no other door open. I’d stand facing the same exact door. The idea of thinking outside of the box was becoming more and more desperate to me, but I felt creatively stumped as how to move my life experience forward and survive— no, not survive, but to live well. As the third rejection letter from grad school came in I began to think about an alternative plan, a plan b. Once I read the blurb on Irvine’s MFA creative writing page, if you don’t hear from us you didn’t get in (I’m paraphrasing, but not by much) I started making the move towards plan b. Plan B is scarier then Plan A. It has nothing to do with honing my craft of writing— although it could. It has nothing to do with networking with other writers— although I don’t really know if that matters, and it also could end with me networking with writers more like myself. It has nothing to do with getting a masters that tells me “I AM A MASTER WRITER”- but it wont stop me from becoming a better writer. It will give me teaching experience and that is about the only thing it has in common with graduate school. My rejections from my grad programs did not deter me from being a writer. I deter me from being a writer regardless of what I’m trying to achieve. My applying to grad school was not just about becoming a better writer with access to other writers and connections in the writing world it was about opening a goddamn door that went somewhere and led me out of this room. It wasn’t the right door. Even though it is a common door and many people try that door and find it does open and it leads somewhere, it didn’t work for me. Not at this time. 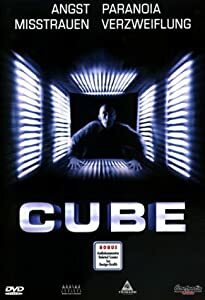 In Cube we find out that the cube is always moving like a Rubik’s cube so even if it is the right door and the right room if you don’t open it at the right time and be quick about going into the room the room will change, and a laser will cut you in half. You off course don’t know when or why the cube moves. Sound like life? The laser is of course a metaphor (I hope). So the door closed once again, but plan b was in action. Three weeks ago, I e-mailed off an application. Last Wednesday, I had an interview over skype, and the following day, Thursday, I was hired. Just like that a new door opened. A door that leads far off to the East farther than I’ve ever gone. I’m nervous about such a huge change and excited for the change for the possibilities, and the challenges, and of course the potential for new stories. In August with just a few bags I will walk through this door that I never saw until a month ago, and once I’m over the threshold, I’ll be working as a literature teacher and leading drama classes in Zhengzhou, China. There’s more to come. There is more to come.